Automobile Enthusiasts and Red Sox Fans, rejoice! Now's your chance to have the best of both your hobbies. You don't have to plaster your vehicle with Red Sox stickers to let everyone know you're a fan because Volvo has just came up with the ultimate collectible for you: The Boston Red Sox Special Edition Volvo C30. 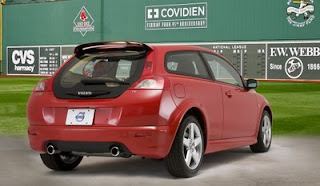 So what can Red Sox fans expect from The Boston Red Sox Special Edition Volvo C30? For starters, this Limited Edition Volvo C30 sports your team color: Passion Red and the Red Sox logo on the front fenders and a transparent logo on the rear glass hatch. You also get floor mats with the team logo inside the car. And to quench the car enthusiasts in you, Volvo made sure that only their top quality car bears the privilege of carrying the Red Sox logos. The Volvo C30 features front fog lights, blue watch-dial instrument cluster, power-assisted and heated front seats, sport pedals, sport shifter, vehicle security alarm, soft load cover,leather-wrapped steering wheel with aluminum inlays, cruise control and the Dynaudio Sound System and is also equipped with the Sirius Satellite Radio. So what else is special about this Boston Red Sox Special Edition Volvo C30 since a lot of Red Sox Fans could probably just buy a cheaper red car and plaster it with Red Sox stickers? Aside from the fact that only 107 of these vehicles will be made, you will also get a certificate of authenticity signed by the president of Volvo Cars America and the President of the Boston Red Sox. So hurry on to selected Volvo Retailers in New England and prepare to pay $29,465 for the Boston Red Sox Special Edition Volvo C30.